VBA results from the 1-group analysis of all patients (n = 197) regardless of treatment risk group are displayed on the average of the normalized T2-weighted images from the first examination for visualization of the spatial localization and extent of the regions. VBA results from the 2-group analysis (LR vs SHR) of all patients (n = 197) are displayed on the average of the normalized T2-weighted images from the first examination for visualization of the spatial localization and extent of the regions. Patient examination after completion of IV-MTX demonstrating T2-hyperintensities within the corona radiata. The regions identified by the VBA are shown for visual comparison. 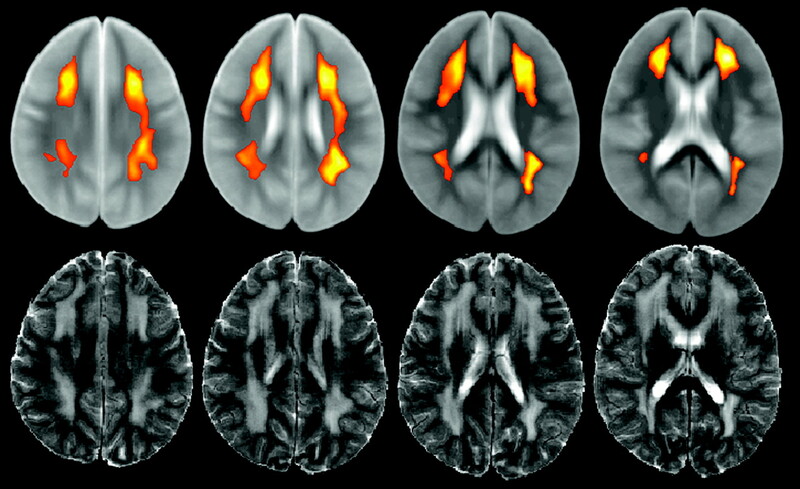 Average T2 signal intensity from VBA clusters on first (left) and second (right) examinations for all 197 subjects to assess symmetry between clusters from each hemisphere. Linear regressions demonstrate slopes of unity with correlations of 0.982 and 0.984, respectively. 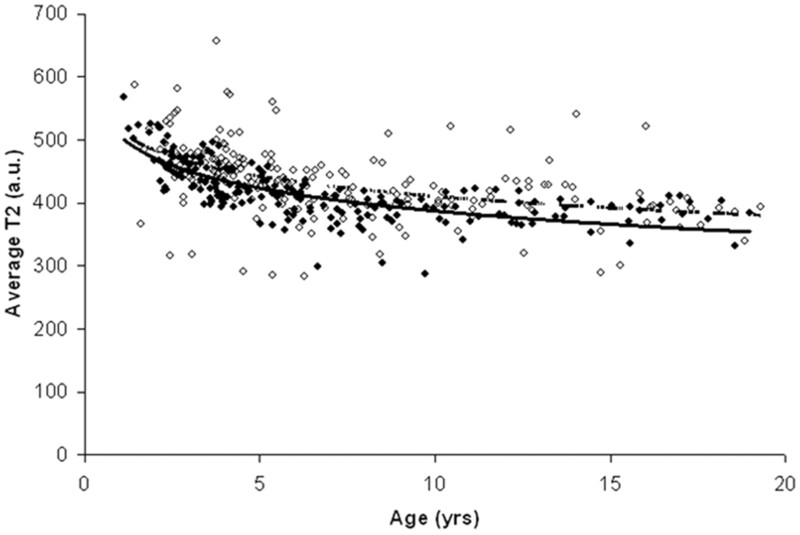 Average T2 signal intensity from VBA clusters on first (filled circle) and second (open circle) examinations for all 197 subjects as a function of age at examination. Signal intensities from both left and right cluster were combined. Logistic regressions are shown for both examinations (solid, first examination; dashed, second examination). Difference in T2 signal intensity between the 2 examinations on the basis of the logistic regressions determined in Fig 5. 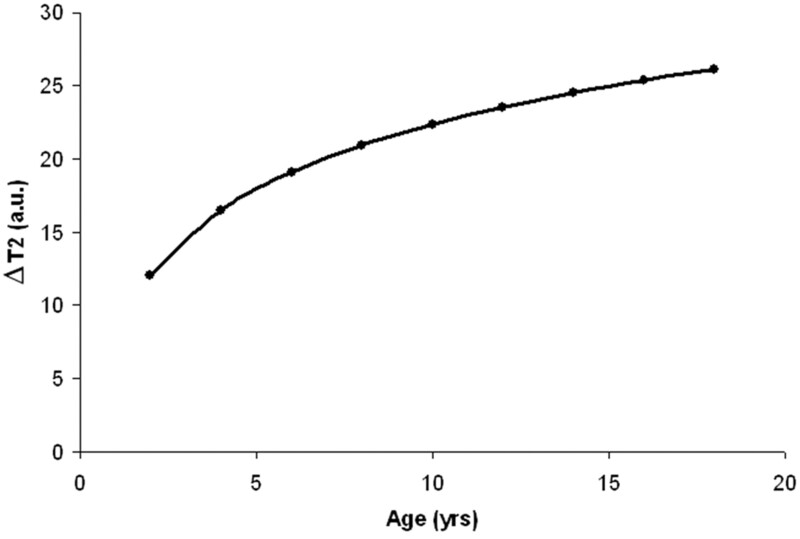 The logistic regressions from each examination were evaluated for ages ranging from 2 to 18 years, and the differences between values at each age are demonstrated. Imaging from a 7-year-old female patient treated for ALL. T1-weighted, T2-weighted, and FLAIR images (A–C, respectively) are shown at an axial level, which demonstrated the hyperintensities within the corona radiata. Corresponding FA, axial, and radial diffusivity maps (D–F, respectively) are shown at the same level. 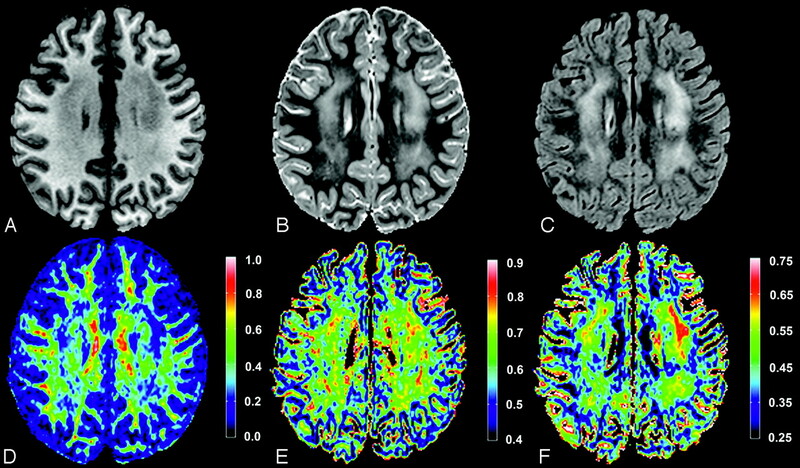 Color bars are shown beside each diffusion tensor imaging parameter map for reference. FA values are unitless, whereas axial and radial values are in micrometers squared per second.